Ashley Deary handles the ball. 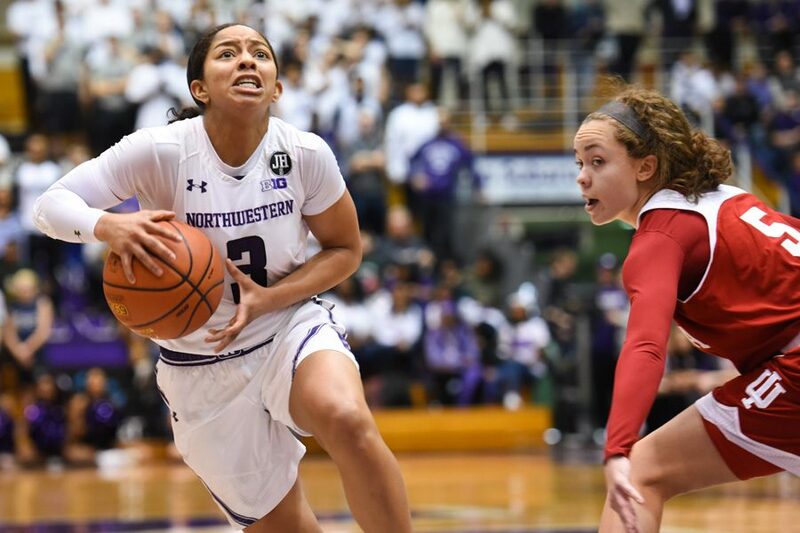 The senior guard will look to lead the NU backcourt against Michigan’s Katelynn Flaherty. Over its past few games, Northwestern has run into a string of high-scoring guards in the thick of the Big Ten schedule. Ohio State’s Kelsey Mitchell, Maryland’s Shatori Walker-Kimbrough, Indiana’s Tyra Buss and Michigan State’s Tori Jankoska have all proved formidable opponents over the Wildcats’ (15-4, 4-2 Big Ten) four recent contests, combining for 90 points. The streak will continue Wednesday as NU heads to Michigan (16-5, 5-2) to take on guard Katelynn Flaherty, the No. 3 scorer in the conference at 20 points per game. Senior Ashley Deary, said it’s the entire team’s responsibility to make adjustments and plan for players like Flaherty. Not only can Coffey help defend an elite player like Flaherty, but her offensive output has also been a boon so far this season. Coffey is the No. 4 scorer in the Big Ten, right after Mitchell, Jankoska and Flaherty, and averages 19.6 points per game. Coffey said that no matter who the opponent is, though, the Cats’ plan doesn’t change that much. Despite facing numerous tough guards, NU has fared quite well — the Cats split their last four games, losing to No. 3 Maryland and then-No. 11 Ohio State, and currently sit in fourth place in the Big Ten. Additionally, only two of NU’s final nine opponents have winning conference records through Monday. Coach Joe McKeown said he is happy overall with the way his team has played its conference schedule so far. McKeown added that he couldn’t provide an update for senior guard Christen Inman’s return after she suffered an injury against Indiana, but said he hopes she’ll be back to face Michigan. Seeking to return to the NCAA Tournament for the second time in three seasons, the Cats will need a win over the Wolverines to pad their resume and solidify their spot on the right side of the bubble. NU has no wins over teams currently in the RPI Top 50 but Michigan is ranked No. 35, well above the Cats’ current best win — the Hoosiers at No. 56. Though a Top 50 win would be nice as NU sits at No. 44, Coffey said the Cats aren’t thinking about the standings and are just trying to keep it simple.